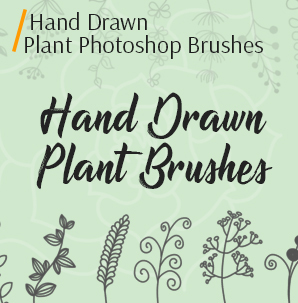 If you’re looking for free star brushes Photoshop that are of high quality and look realistic, download these 10 free brushes for creative photo retouching. 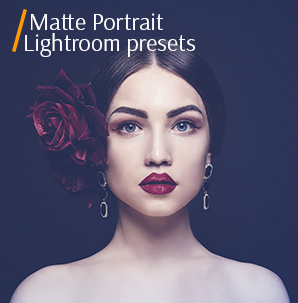 Let these image retouching plug-ins be your helping hand while editing night photographs on a regular basis. 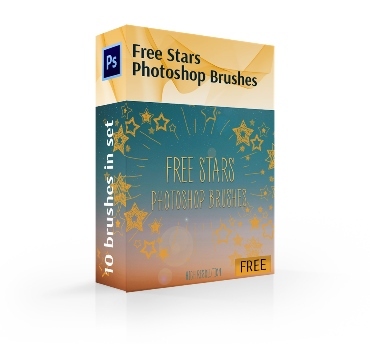 The Photoshop Star brushes free are very easy to install, customize and use even if you are not a professional Photoshop user. The following 10 free Star Photoshop brushes are designed in a realistic manner for you to depict all the beauty of the night sky. 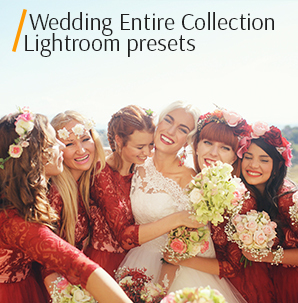 Select the most suitable free Photoshop Star brush to put the final touches on your images. People often look up at the sky, pensively gazing into the colorful star myriads and admiring the beauty of the night. Sometimes, there are no stars at all, but you wish to get a beautiful photo to share in social networks, post on the website or add to your photography portfolio. For such a case, you may simply download free Photoshop Star brushes and don’t wait for a suitable moment. In fact, stars may serve as a beautiful decoration to make your pictures more interesting and eye-catching. That’s the main reason to download Photoshop Star brushes free collection and enjoy the marvelous results. All in all, starts may “save” the most unsuccessful photo and make it magical. Besides, if you are engaged in the digital design, you’ll be able to create the most spectacular projects. So, enjoy the process with these professional free Star brushes Photoshop. 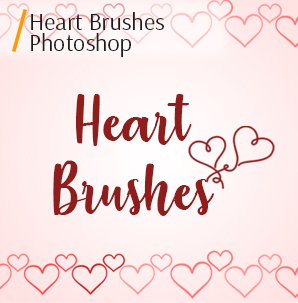 Decorate your images, postcards, banners, websites, business cards and anything you wish, using these Star brushes. Attract more clients and impress them with a non-standard approach to regular tasks. Add a little magic to your works making them truly memorable. If you wish to add small stars to the background and bigger ones to the foreground, this free Photoshop Star brush is just what you need. Tip: This tool is effective to make the background more dramatic and prominent. Well-balanced starts, that are practically invisible in the background, help to accentuate the main object. They may also serve as a wonderful framing. Tip: Use this free Star brush Photoshop to decorate an image of a sleeping child. It looks like a transparent star and a colorful one has been combined into one figure to achieve a more interesting effect. Tip: Make your party photos more atmospheric with such a brush. 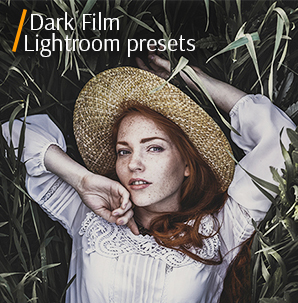 Think that your picture lacks some creative patterns and elements? Use this Star brush Photoshop. You can try to combine it with other elements from this package if you want to get an original effect. Tip: You can create an unusual background with this brush. Use this brush with interesting borders to highlight the background of the photo. The stars are evenly arranged, which create a beautiful pattern. Tip: This tool comes in handy if you wish to fill your background with galaxies to achieve a moody picture. It looks like you get two stars with a single mouse click – the first is in the center of the figure is a border, while the second one is a border. Tip: Apply this free Star brush Photoshop to interior pictures. Looking for three-dimensional stars? This brush is very useful if you are engaged in design. The tiny stars in the upper right corner look almost invisible, while the front elements attract viewers’ attention. Using this brush you may create the illusion of movement across the entire frame. 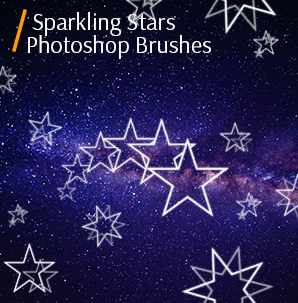 Tip: If you have lots of orders to finish during a holiday period, you won’t manage without this Star brush Photoshop. You can use it to create gifts for your relatives and friends, decorate postcards, make unique wallpapers and posters. The stars are beautifully grouped with several elements stamping together. You can configure the opacity level depending on your needs. Tip: Create a fairy-tale shot. Take a photo of the night sky and add a few stars to the horizon. It looks like you have a firework of bright stars in the lower right corner of your shot. They “move” from the bottom to the top, creating a beautiful pattern. Click at the button and receive Free Star Brush within 2 minutes. Write your valid email address and your first name and receive these filters free of charge. 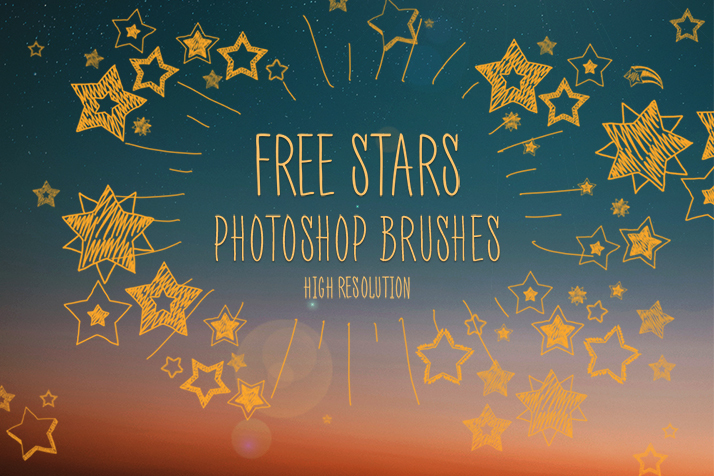 Save your free time and buy this Star Photoshop Brushes bundle made by our experienced retouchers and photographers. Stylish and beautiful packet with one click. 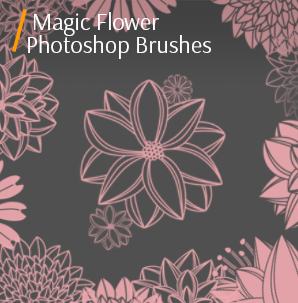 Tip: This free Photoshop Star brush, similar to all other tools in this kit, is easily customizable. It is also a great way to imitate noise, dust or even snow. Make your photos even more charming. Using this free Star brush Photoshop, you can add the star with a trail to emulate meteor shower. What a miracle! Tip: Use it for children photos taken in the playroom or nursery.